This week the workroom turned one. Actually, today (October 17) is the day I opened to the public last year and made my first sale… to Johanna, the workroom’s quilting instructor. Thank you for coming by that day and buying some fabric from me, Johanna. I was so nervous cutting fabric for the first time! It was actually almost two weeks before I made my next sale. That was a bit nerve wracking. Tuesday night was the anniversary party and I was just so overwhelmed at how many of you dropped by to say hi and celebrate this special occasion. 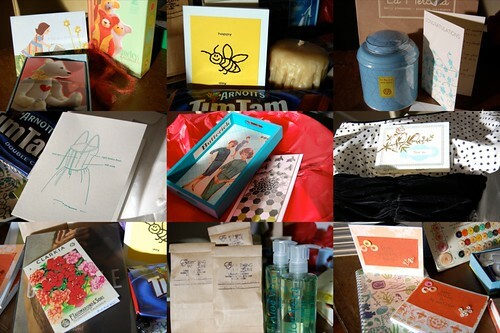 I was even more overwhelmed by the fact that so many of you brought sweet gifts and beautiful cards! It will take me a few more days to send each of you my personal thanks, so I wanted to make sure you knew that it meant so much to me that you were there. Your thoughtful gifts and words remind me what a beautiful and vibrant crafting community the workroom supports. the workroom exists for you and because of you. I’m sorry I had to miss the party, but Tuesday was my yucky long day at work, and then I had to vote, etc., etc. Happy birthday! I’m sure glad to have such a wonderful shop in my ‘hood. i was so sad to miss the festivities. it is coming time to come home. Happy birthday Workroom! I was on day 2 of a huge migraine that night, so I had to stay home– but I have a little present for you too! jennifer – i missed you at the party, but working and voting is important! see you soon. becky – when are you coming home? i’d like to mark my calendar and start counting down the minutes. shannon – are you feeling better? i’m sure i’ll see you soon!